Our next member spotlight falls on new member, Jay Higginbottom. For those that know Jay, he can sometimes come across as a quiet guy. But, apparently, you put him in front of a computer and he opens up...quite a bit! I was born in Augusta, Maine in 1971. Growing up in Hallowell (ME) and Victoria, BC (Canada), I spent summers swimming in quarries and lakes, and riding bikes. My father always supported my athletic pursuits, including youth hockey, baseball, and soccer. But as a late bloomer, I became discouraged with team sports. Then, inspired by the Los Angeles Olympics, my best friend and I challenged ourselves to run 13 miles to the lake, and I found that I was a runner. The following fall, as freshman, we helped start our high school’s first cross-country team. I also became a miler, 2-miler, and pole-vaulter on track team. I came to the conclusion I was better at individual sports. It took me years after to learn that solo sports don’t have to be solitary. With my parents help, I spent my senior year in Rennes, France as a high school exchange student through Philips Exeter Academy. This influential year helped me discover a love of art, language, and architecture. But also left me with a couple unhealthy byproducts of the French lifestyle that derailed my running, including an addiction to cigarettes and a love of Bordeaux. Then as an engineering, art and architecture student, and Delta Chi fraternity member, at Lehigh and Columbia Universities I didn’t see the sun, run, bike, sleep, or treat myself very well. I did return to France in 1991 again as a student, for a year of design studio all-nighters, museums, sketching in the city, and hours with friends in smoky cafes and bars. After graduating, I completed my education in Boston at the Boston Architectural Center in 1997. 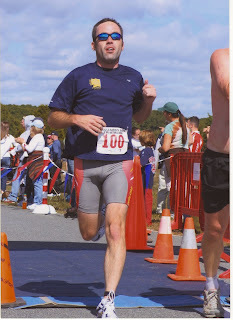 After grad school I slipped in and out of running, and with the help of Yoga was able to kick smoking and finally recommit to running in 2003. Since then I have run too many road races to count, several half marathons, and participated in the Reach the Beach Relay 5 years in a row. I’d always thought triathlons were the exclusive domain of the hard-core athletes I saw in the Olympics, rather than running enthusiasts with an artist lifestyle like me. But in 2005 a very close friend convinced me to sign up for a sprint tri, and we trained for it together. Later I met Pat Dwyer who sold me my first wetsuit, and helped me understanding transitions and race prep for my first full triathlon. Pat also introduced me to BTT (Ed. Note. : What a great ambassador to the team and the sport!). I completed my first sprint triathlon in 2006, my first standard tri in 2007, and now I am training for my first ½ Ironman this year. What I love about triathloning is that competing or training recaptures the feeling of freedom I had that summer as a kid running to the lake to swim. Today I am a registered architect practicing with MDS Inc architects in Boston: (http://www.mds-bos.com/), a professional painter and instructor at Fort Point Studio School (http://www.fortpointstudioschool.com/). My artwork can be viewed at http://www.jacobhigginbottom.com/ (Ed. Note. : Blatant Self Promotion!). In additional to triathlon I love windsurfing, sailing, snowboarding, yoga and recently (thanks to BTT) started xc-skate skiing. 1. What are your goals and expectations for your upcoming race season? This is my first year with BTT and I am very excited about the upcoming season, and the friendships I have made on the team. With the exposure to all the BTT resources, group training, the newbie mentor program, and casual conversations with teammates at social events, I am preparing with a lot more rigor and diligence than before. I have greatly benefited from working with Ali Winslow to improve my swimming and biking. I am training for my first ½ ironman at Timberman in August. I am nervous about the distance involved, but know that if I stay the course I can do it and maybe even do well. 2. Out of all three events, what is your least favorite and why? I love the combination of the three sports. I don’t have a least favorite, but my weakest/ least satisfying right now is the bike. I have been working to improve my power because, until joining BTT, I was riding more like a recreational cyclist than a racer. 3. How long have you been competing in triathlons? 2009 is my fourth season. 4. What was your first triathlon event? 5. Lessons learned from when you first started to now. You get from your body what you put into it. Treat it right. 6. Any words of wisdom, advice or anything you would like to share with your fellow teammates?? Love the process. Yoga has played a large role in maintaining flexibility, health, nutrition and balance for me. I love how the combination of triathlon and yoga makes me feel. I feel it translates to confidence in other areas of my life and a general sense of resiliency because I am at home in my body. Your body is your temple and needs to be treated well. Even though triathlon is essentially an individual sport I couldn’t, and wouldn’t, take it on by myself. I love participating in group activities, and seeing others struggle and succeed. It is for me analogous to many things in life where working with others helps build a more developed sense of self, and subsequently greater achievements than working alone. The concept of relying on a larger wisdom is powerful. “Knowing your limits” is a self-fulfilling prophecy. If you admit that you don’t know where life will take you but decide to love the journey…you never know what you might be able to achieve. For me the joy of triathlons comes from focusing on enjoying the process, the feel and technique of being on the road and in the water, rather than exclusively focusing on the outcome. Triathloning has informed my life, my work and my art. But if you keep looking behind you or worrying about your performance relative to the next person, you can’t focus on the now. Celebrating your own personal technique, voice, and pace is the only thing that will enable you to improve.